Amaya had so-so days and not so good days during the weeks after her discharge from the hospital. Rarely did she ever have a day that didn’t include a headache or a leg cramp. I was emotionally and physically exhausted. The night hours were the worst. I’d alternate from feeding my infant son, who also never seemed satisfied, changing his soaked diapers, to filling Amaya’s sippy cups, changing her sheets that would be covered in that gelatin stuff that comes out of diapers when they get too full and finally back to my bed. As soon as my eyelids would get that perfect seal that told my brain that sleep was just a wink away, the red lights on the baby monitors would light up and my zombie feet would hit the ground and groggily make their way back into the kid’s bedroom. I was rallying on a couple of hours of sleep a night, still trying to work, juggle the endless doctors’ appointments and still be a good mom to Sophia, who most definitely was getting the short end of the stick. After about a month of medications, Amaya’s thirst mechanism wasn’t responding and her fluid intake continued to climb. Her kidneys, however, did respond and stopped making urine. We were constantly trying to adjust the dosage to match her fluid intake. At one point, she had some much fluid on board that she experienced water intoxication, mild brain swelling and a seizure. That was by far, one of the scariest things I had seen as a parent. She was admitted back into the hospital for more testing. We were back in room 426. What were the odds that we’d be placed in the same spot as before. It was an eerie feeling. Dr. C, Amaya’s specialist, was ordering a whole gamut of tests. Her fluid intake and urine output would be measured and nothing would be restricted. A neurologist was called in to check Amaya’s brain activity after the seizure and a nephrologist (kidney doctor) would be on their way as well. After a whirl wind of exhausting Q and A with the team of doctors, they finally left the room. I sat and stared blankly at the wall. “I feel Dr. S is a really good neurologist. I met him earlier.” I peeked over the hospital crib railing and saw a petite blonde mommy stroking her newborn baby’s head. She gave me a little smile and said, “My name is Erin and this is my daughter, Makena. We were just admitted an hour or so before you. Sorry, I didn’t mean to listen to your conversation, but I couldn’t help but hear. These rooms allow for no privacy.” She wasn’t kidding about that. “My name is Darla and this is Amaya. Don’t be sorry, we are in tight quarters here.” I managed a smile back. Our conversation was interrupted with a new gang of doctors that had returned to examine Makena. I busied myself by getting the DVD player from home set up. We learned during our last hospital stay that these can come in very handy. Soon enough, a child life specialist came into the room with some movies to choose from. We’d put them on as the neurologist ran the EEG, he needed Amaya to be as close to sleep as possible. It worked. Amaya laid perfectly still in the dimly lit room while the doctor recorded all of the blips and bleeps on the screen. Hospitals remind me of casinos. You begin to lose all concept of time; the hours run into days, the days into nights and before you know it everything becomes a blur. The lack of sunshine and sleep deprivation does something to your mind, you get cranky easier and weepy over spilled milk. 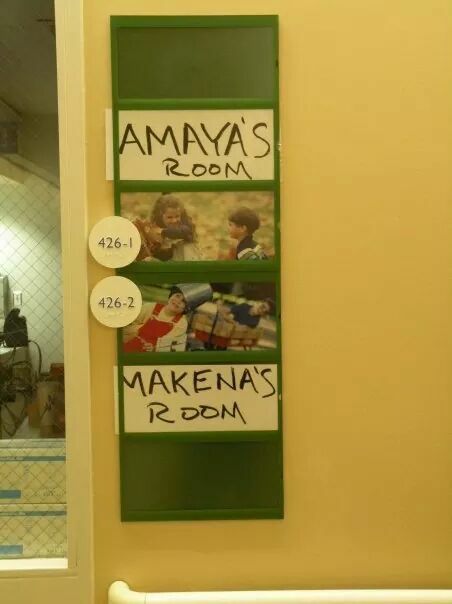 A few days into our stay Amaya was going to be transported to another facility to have a PET scan. They were going to take a closer look into her brain, specifically her pituitary gland, to see if there was a tumor tucked away in one of the tiny crevices. 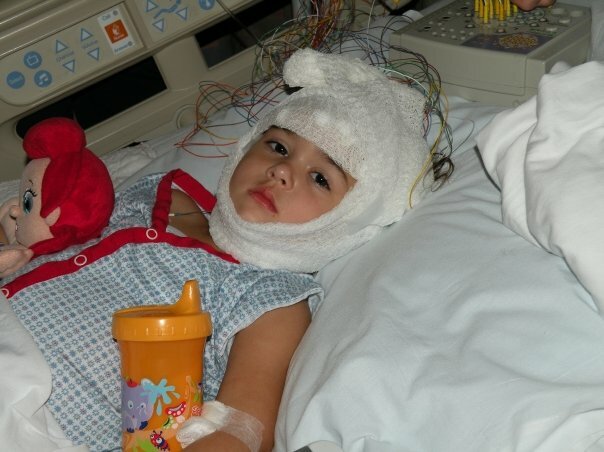 That meant that Amaya had to be restricted with her fluids for at least twelve hours before they could anesthetize her. That was a nightmare. Amaya was awake, begging and crying for something to drink most of the night. Just when I’d get her calmed down, close to sleep, a nurse would come in to take her vital signs. If not the nurse, then the blood suckers would come for another vile, poking her already bruised veins. Her screaming would wake Makena in the crib next to us, which meant that Erin would be awake for another unknown amount of time. The cycle was nearly unbearable. The ache in my head was almost as painful as the ache in my heart. I just wanted this nightmare to be over. Finally the transport team arrived at 6:00 am. I was happy that it was early in the morning; the sooner we were done the sooner Amaya could have something to drink. They scooped her up and placed her into a car seat that was rigged onto a gurney with all sorts of tubes, bleeping machines and scary straps. Before they could get her clicked all the way into this scary contraption, Amaya arched her backed and flipped herself out of the seat, getting caught in a strap just inches before she hit the cold tile floor. The will and fight in this child is unbelievable. She tore the sensors from her fingers, managed to rip her IV line out causing the alarms to sound. The noises only freaked her out more. Finally, one medic held her down, while two more restrained her arms and then legs. 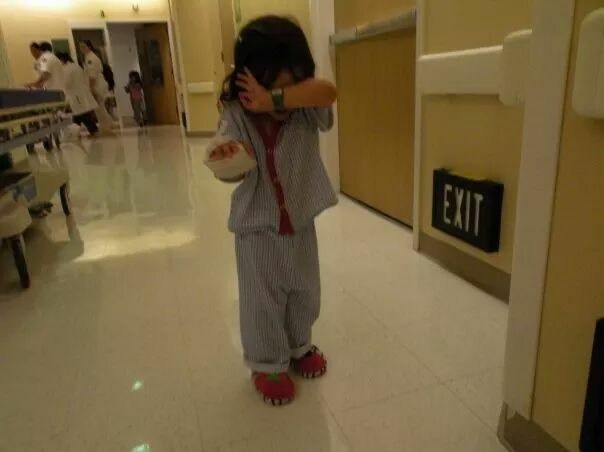 They quickly rolled her down the hospital corridors towards the back exit while she screamed, “MOMMY PLEASE HELP ME! !” I followed behind the gurney, the knot in my throat told me tears were soon to follow and I couldn’t let Amaya see me cry. “Yes?” The look on his face was not good. A sinking feeling dropped into my stomach and my heart pounded in my chest. Please don’t say she has cancer. They couldn’t possibly give me a diagnosis now. I knew they had to consult with other doctors. What could be wrong? “I’m very sorry to say that there has been a problem. The machine Amaya was about to go into has broken down. We will not be able to do the scan on your daughter today.” I started to see red. 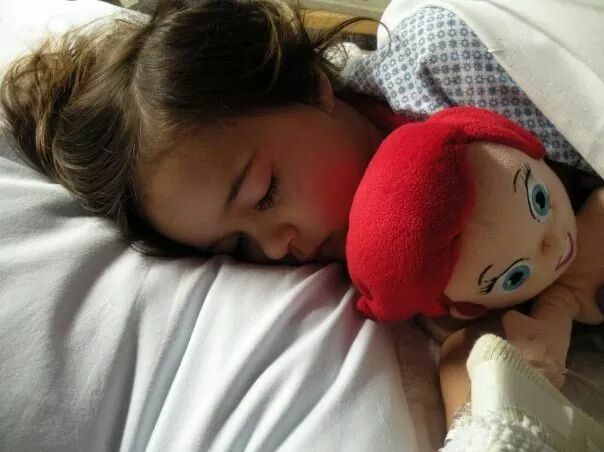 “Hasn’t she already been injected with the radioactive dye and been knocked out?” Did this man have any idea what the previous 24 hours have been like for my sweet girl? the chilly catacombs between the children’s hospital and St. Joe’s. Eventually, we’d end up in the cafeteria and grab a late night snack. After a week or so, we decided to make our hospital room more like home. 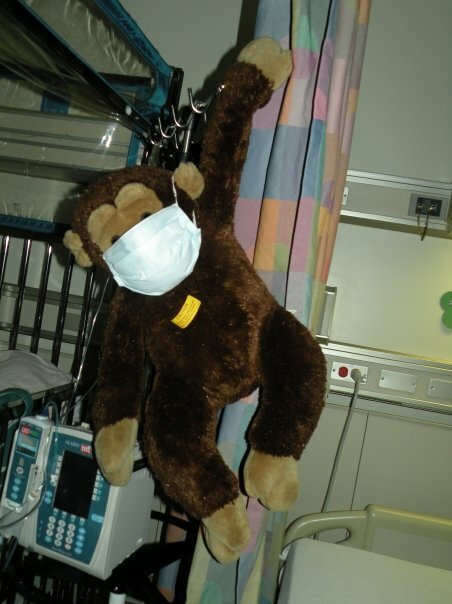 We covered the walls with art work from well-wishers, pinned cards on the wall and hung Amaya’s favorite monkey from her IV pole. I expected the nurses to say something, but they never did. We were half way through our second week when the great news of no tumor came. That in itself took a thousand pounds of pressure off of my chest. The lingering question was still heavy in the air, what is it then? My cell phone rang and it was Bebe, Jim’s sister. She was constantly researching symptoms, looking everywhere, filling me in on things she thought relevant. What Bebe had to tell me on this day was unsettling. There has been a research study that linked BPA (Bisphenol A) and Turner’s syndrome together. BPA is the chemical that is ever so popular in our children’s products, water bottles and food storage containers. Turner’s syndrome is what took the life of my first baby girl, Machaela. This entry was posted in BPA, childhood, despair, Diabetes Insipidus, Environmental Toxins, family, god, Health, Illness, Mystery Diagnosis, strength, Turner's Syndrome, Uncategorized and tagged birth, blessing, childrens hospital, Diabetes Insipidus, family, friends, healing, health, hospital, overcome, prayer, strength, support, turner's syndrome. Bookmark the permalink.